Channel set engagement ring with 12 princess cut diamonds totaling .6 carat embedded to add extra sparkle. 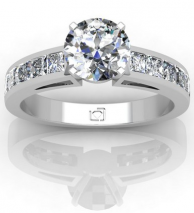 This setting is beautiful, durable platinum, and versatile, able to be set with any shape diamond. 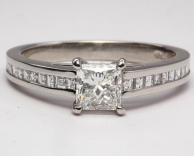 12 princess cut diamonds are channel-set in the platinum band on this beautiful setting. Add the center diamond of your choice, which can be any shape (shown here with a round diamond), to complete this exceptional ring. This gorgeous engagement ring includes carré-shaped diamonds (completely square diamonds) channel set into the platinum band, accenting your center diamond and providing additional sparkle. You can choose any shape diamond to set in the center of this ring. This beautiful engagement ring has channel set princess cut diamonds on either side of your center diamond to add additional sparkle and emphasis on your centerpiece. You can choose a diamond of any shape to set in the center of this setting. Twelve princess-cut diamonds totaling 1/2 carat are channel set into the sides of this beautiful platinum engagement ring. 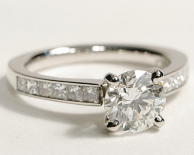 This ring sparkles brilliantly without cluttering your center diamond with extra halo or side-stone diamonds. Shown here with a traditional round diamond, but this ring can also be set with a diamond of any shape. 16 Asscher-cut diamonds are channel set into this exquisite platinum band. Your center diamond, which can be any shape, will complete this engagement ring with a look that's sure to impress. Total diamond weight of the channel set diamonds is 1/2 carat.